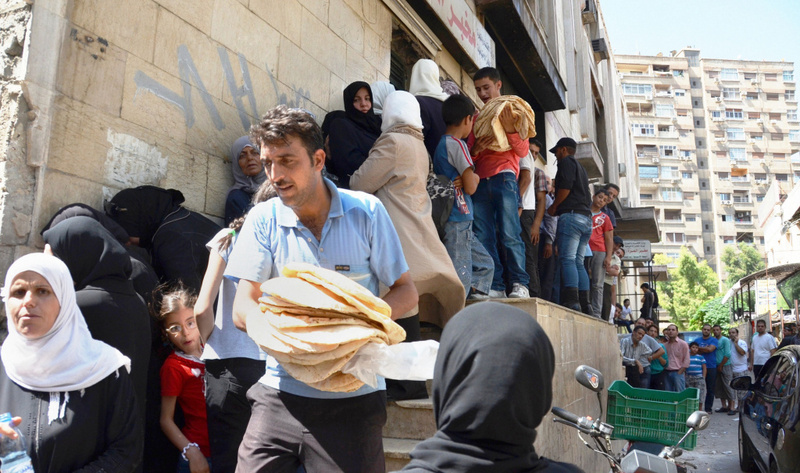 Shoppers form a line at a bakery in Damascus, Syria, on Friday. Ahead of President Obama's speech Saturday, the price for a bag of pita bread shot up amid speculation of a U.S. military strike. President Obama meets with Senators John McCain and Lindsey Graham at the White House, today, in a bid to sell the foreign policy hawks on the idea of military intervention in Syria. This past weekend, Obama argued that a limited strike on Assad's regime for the use of chemical weapons is justified. However a Congressional vote won't take place until lawmakers return to the Hill next Monday. In the meantime, there's a lot of debate to the extent of what America might do, if it plans to take any action at all. To explain are Sebastian Usher, the BBC's Middle East regional editor, and Seung Min Kim, Politico's Congressional reporter.